2013. Digital colour print of explosion action, variable dimensions. Thousands of individual grains of sand, collected from a Pacific Ocean beach in Taiwan, are glued to the outside of a rocket projectile. 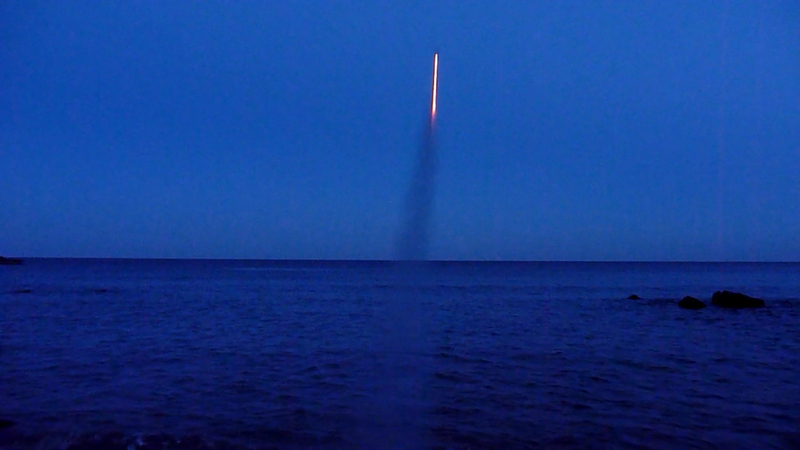 Over a rising tide and out to a serene sunset over the Atlantic Ocean, England, six rockets are launched on independent journeys ‘out-there’ into the vastness of space. Moments after their launch from earth, the rocket explodes and the Pacific grains of sand fall into the Atlantic. Each sand grain now drifts in free association, it is imagined, on an epic odyssey back to the Pacific Ocean. Visibly lost but ‘out-there’, each sand grain now drifts in a force that binds everything together in the universe. Always in motion is the future.